Today I'm covering the Urban Conquest supplement for the 8th Edition of Warhammer 40,000. Games Workshop is starting 2019 strong with a new campaign boxed set for their main game in the grim dark future of the 41st millenium. Urban Conquest picks up the city fight theme of its predecessor from the 3rd edition City Fight and 4th edition Cities of Death. But unlike the older supplements, this is a boxed set, covering not only the rules, but a bit of terrain and a modular campaign map. 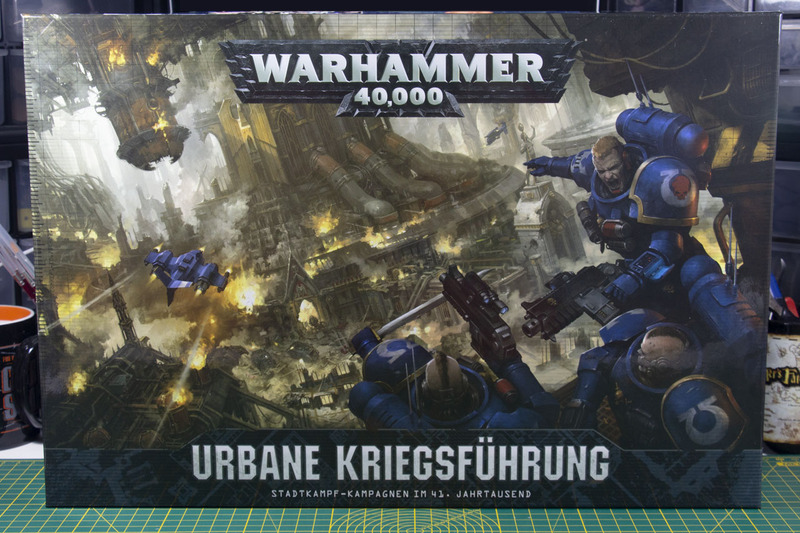 Games Workshop sets the price of this boxed set at 80 EUR and this review will cover the German variants, Urbane Kriegsführung. Identical to its english counterpart, just with the German rulebook and texts on the cards. For the price you receive an 98 pages thick book, covering new rules, scenarios and introduction for your own campaigns, along with four sprues of terrain, multiple stacks of cards, tokens and a huge campaign map, that can be pinned to the wall. 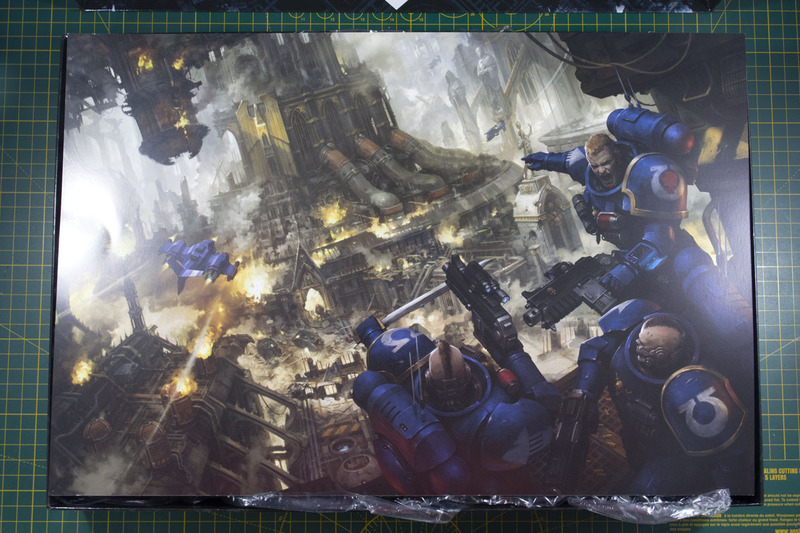 When you open up the box, you'll see a full size artwork of the cover. Games Workshop adds prints to most of their boxed sets lately and I have a decent collection. I might get them framed for my hobby den, as they are quite nice. 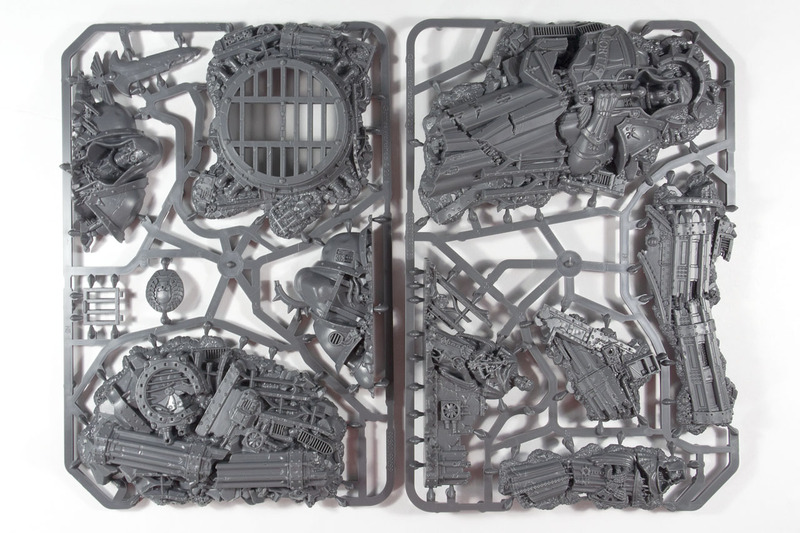 The idea behind these was to separate the sprues from the other game components and guard them from damaging each other. 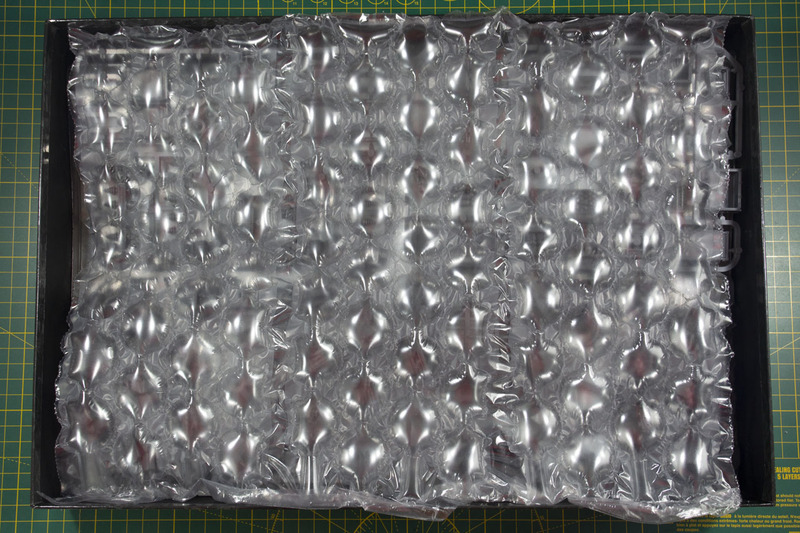 But as the popularity of the prints rose and the prints did their job, but got damaged / punched / pierced themself, Games Workshop added a solid sheet of bubble wrap to this box. 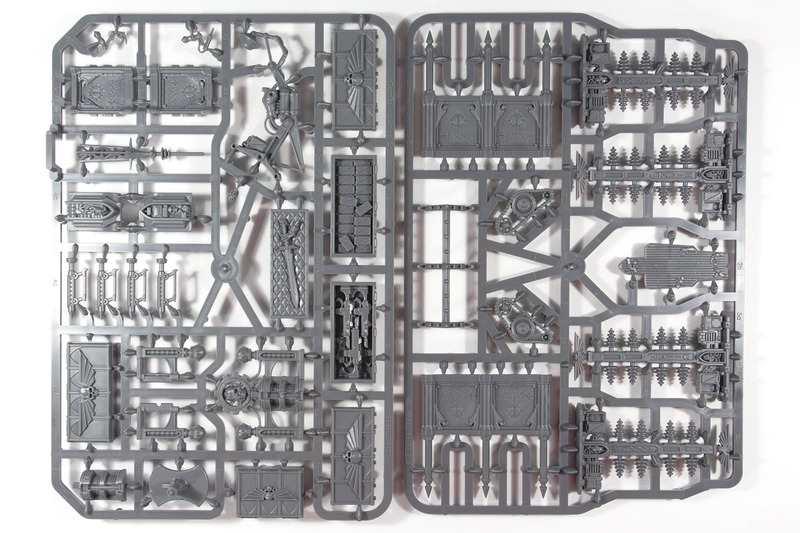 But that could be in there, to fill the space within the box, as it is not packed like some other kits. 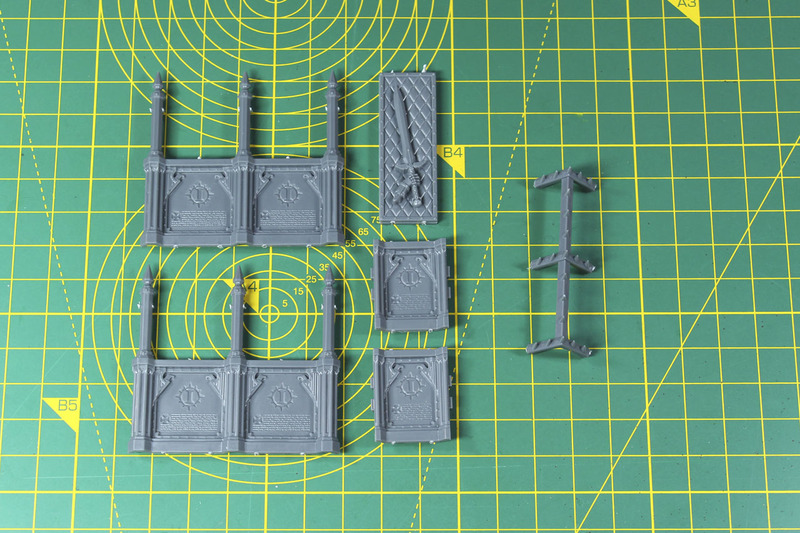 The terrain pieces are spread across four small sized sprues, but more on them further below. Main part of this set is the modular campaign map. 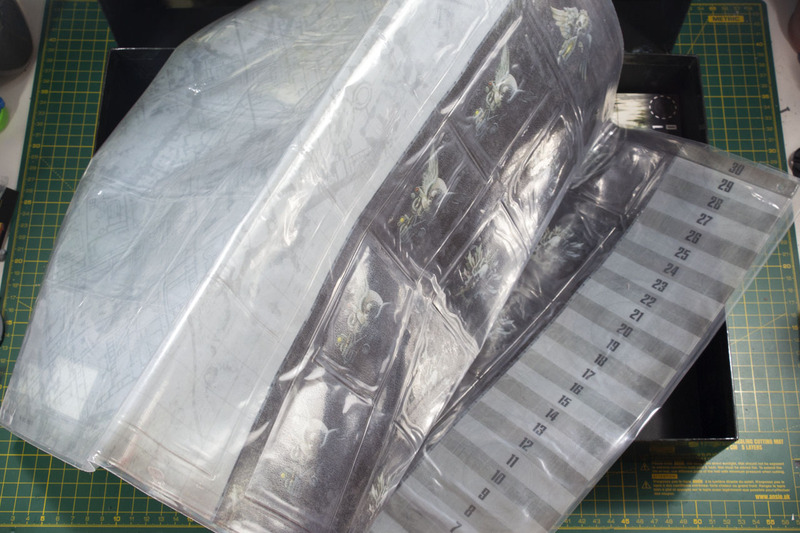 It is made from soft plastic, like the binder sheets for trading cards. 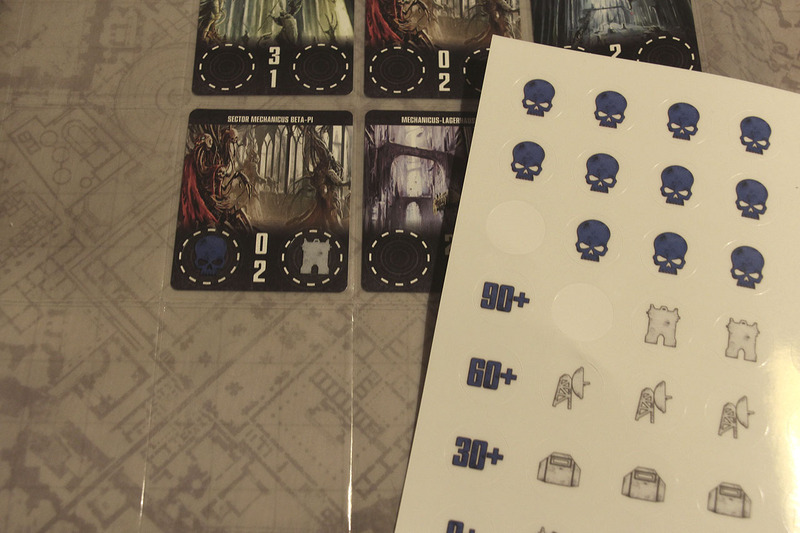 It has sleeves / pockets, where you can put in the different sized cards used for the this campaign supplement. This is so huge, that I wasn't able to take a picture on the cutting mat. You have to fold it twice to store it in the box. The map has a smell due to the used material similar to new beach toys (like an inflateable water ball), but that vanishes after unfolding and letting it rest a bit in a well ventilated room. Below that, you will find the book (full sized, 98 pages), cards and markers in the box. I'll cover the book further blow, but the cards are split into locations, strategic resources and random events, as well as the players information. 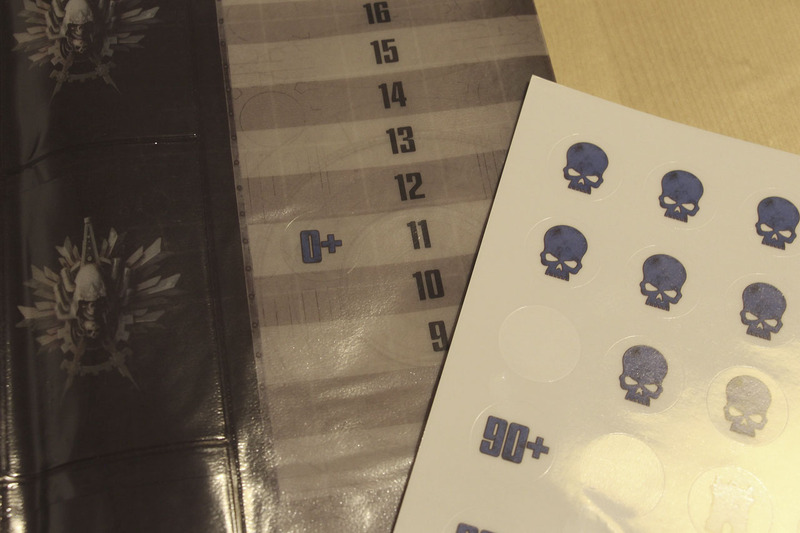 There are four sheets of coloured markers / stickers, that will help you keep track of the affiliation of locations to the player. 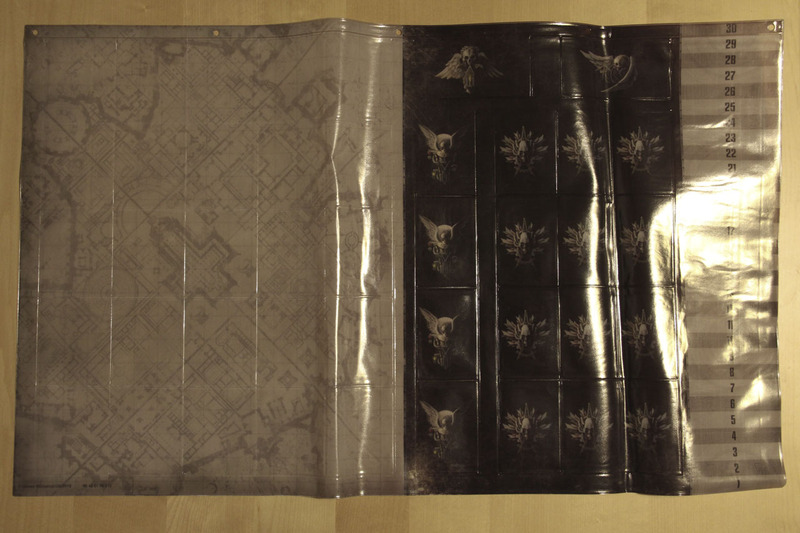 The map has sleeves / pockets, where you can put the cards into. 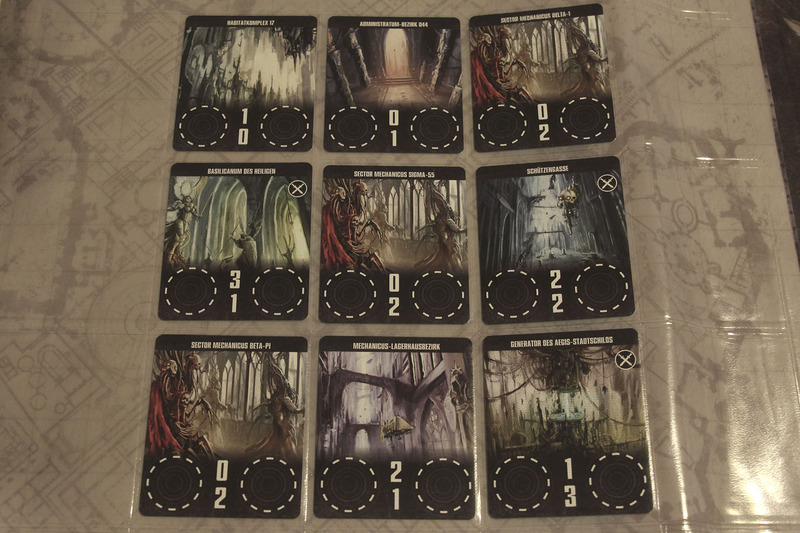 These are for example used with the location cards to set up a campaign map. You can keep track with the markers, to whom these locations / parts of the city belong and if you added upgrades to the locations. 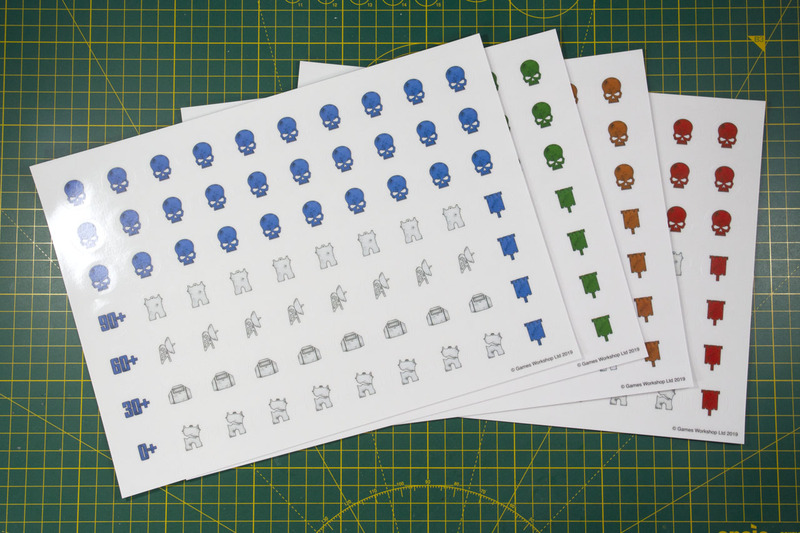 The markers do not have glue on the backside, they are held in place due to static cling and can be reused. There are numbers to keep track of the score board. As all of the items - beside the markers - are stored below the top layer of the plastic, you could use a white board marker to draw / write on the map and wipe it away after using it. Now for the sprues, these are the size of the smaller boxes. And are two different sets, one covers smaller objectives and the other one ruins and a sewer gate. 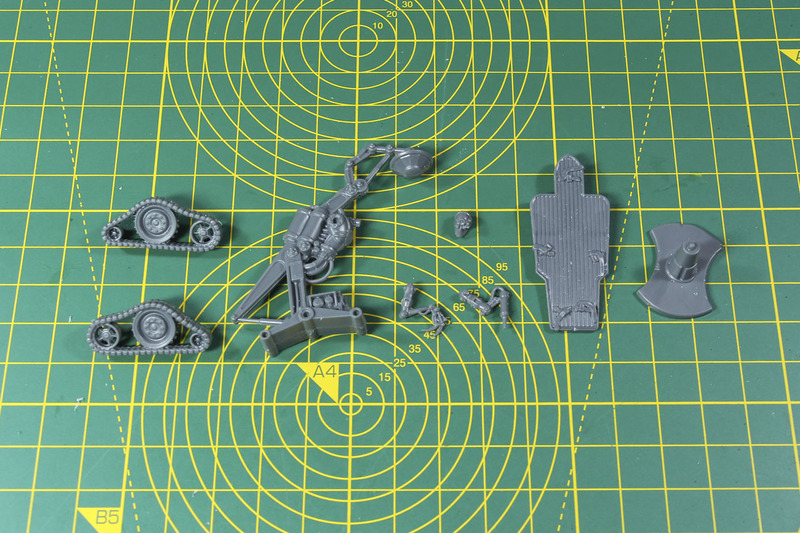 Casting is quite good and the sprues are properly filled. Mouldlines aren't a big issue on the sprues. I couldn't find any assembly instructions on these in the box, which is unusual. Maybe they missed it, maybe due to the low complexity it is assumed that you assemble them by the pictures in the book / on the back of the box. 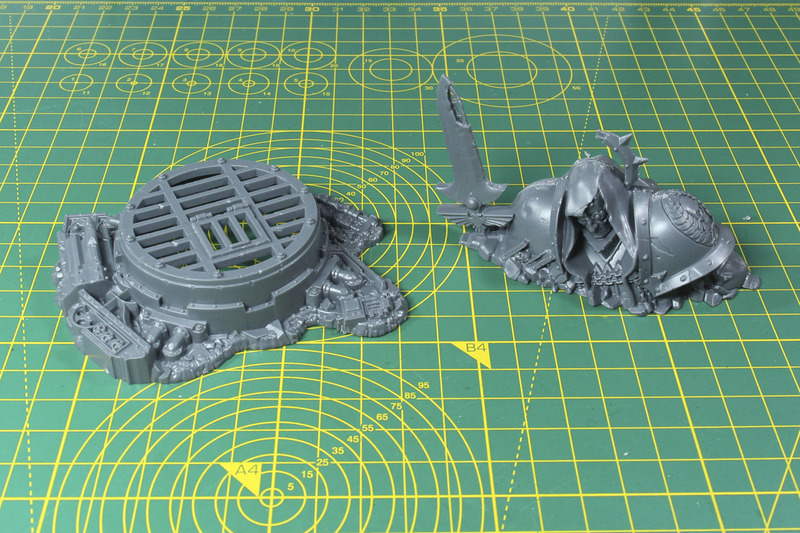 There are a couple of single part pieces in this kit, primarely the ruins from the Sector Imperialis. 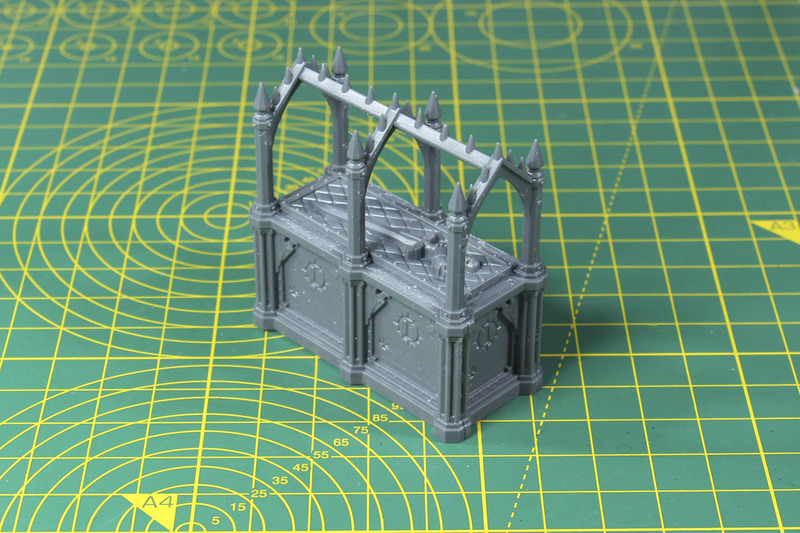 They cover the pillars, small and large statues from the Sector Imperialis kits, I covered the Basilicanum from the range on here, as a review as well. The sewer needs a small gate to be added and the remains of one of the larger statues is three pieces, front, back and shoulder insignia. 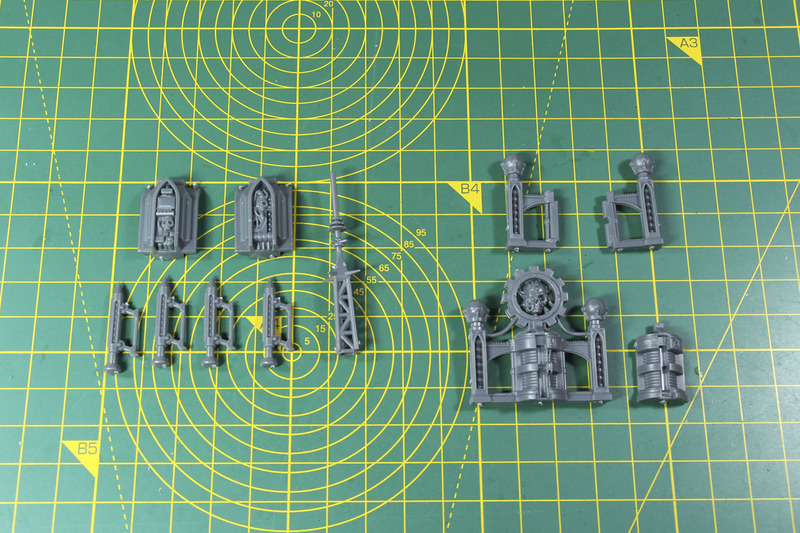 The smaller bits on the second pair of sprues are mixture of different items. 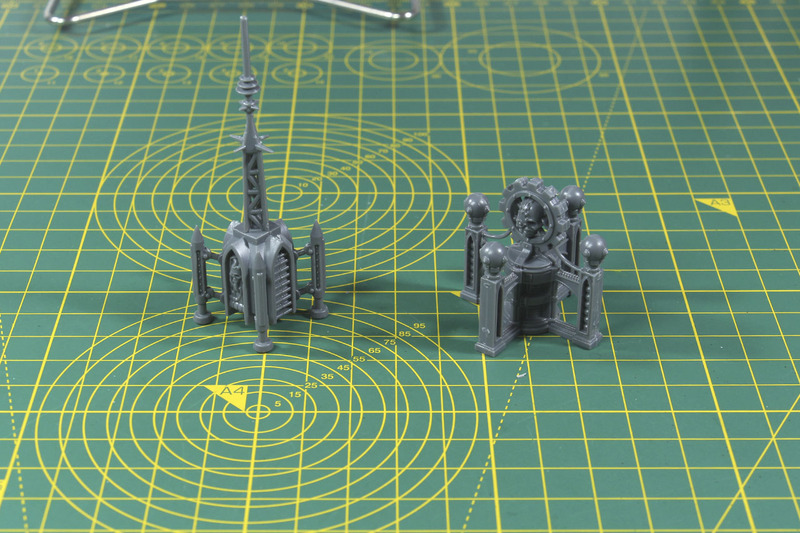 Many of the other bits are taken from the Objectives Markers set or variants of them. 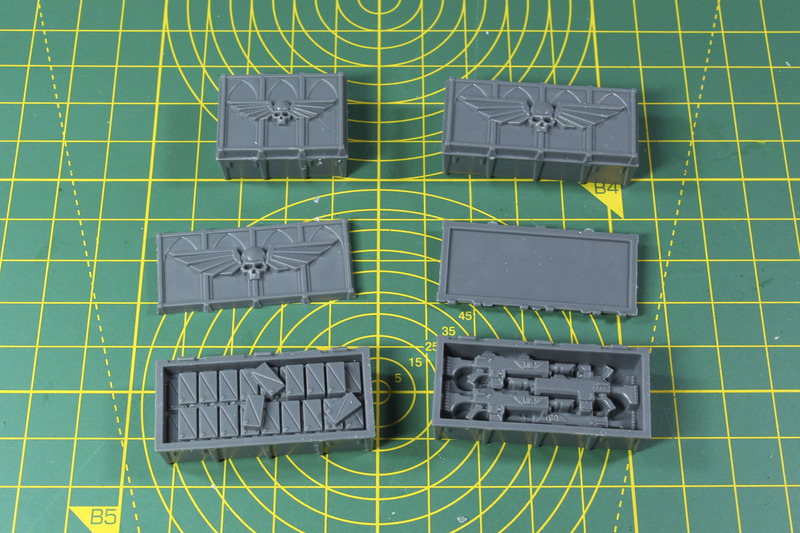 The crates are known in different designs from the Sector Fronteris / Moonbase Klasius, Kill Team Rogue Trader and/or Sector Munitorum/Armoured Containers set. The crates can be stacked, the ones in the top row are closed, the other two have moveable lids. 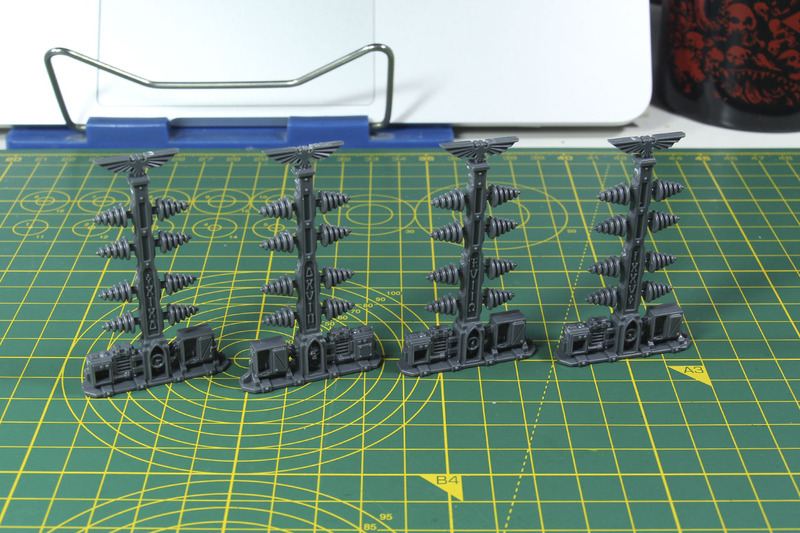 The antennas remind me of the terrain from the 4th edition Battle for Macragge starter set. Nice to pick that idea up, as it is a very plausible piece to mark an objective. 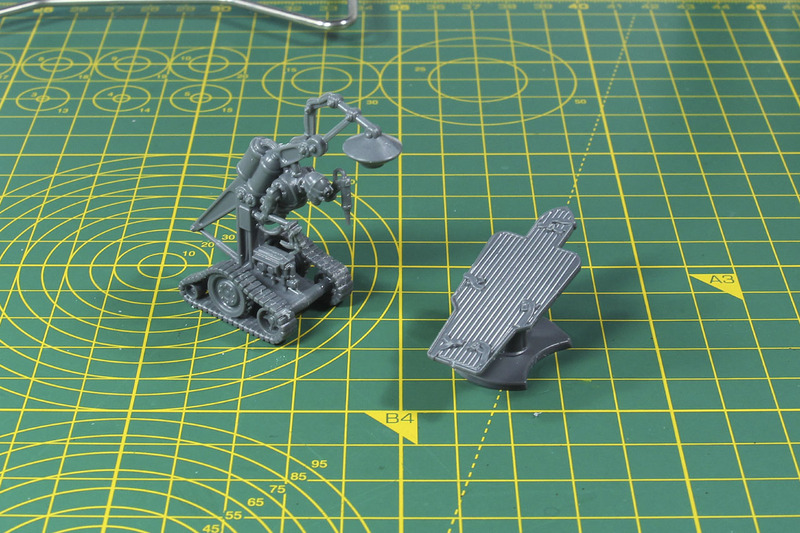 The Field Medicarium, a sinister medicae servitor and operating table, is a variant from the Objectives Marker set, but with tracks instead of the plinth. The Orbital Vox Array is from the same kit. The small generator is a new set, but looks like a shrinked down variant of the void shield generator. 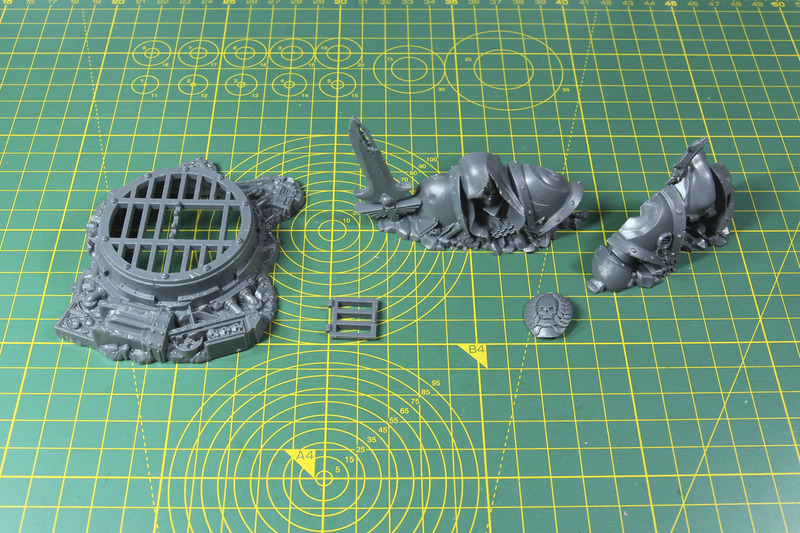 And the last piece is a reliuary shrine, with a power sword and part of an Space Marines arm. You could replace the tablar in the mid with a bit of plastic card and add any item you find suitable for a relic. 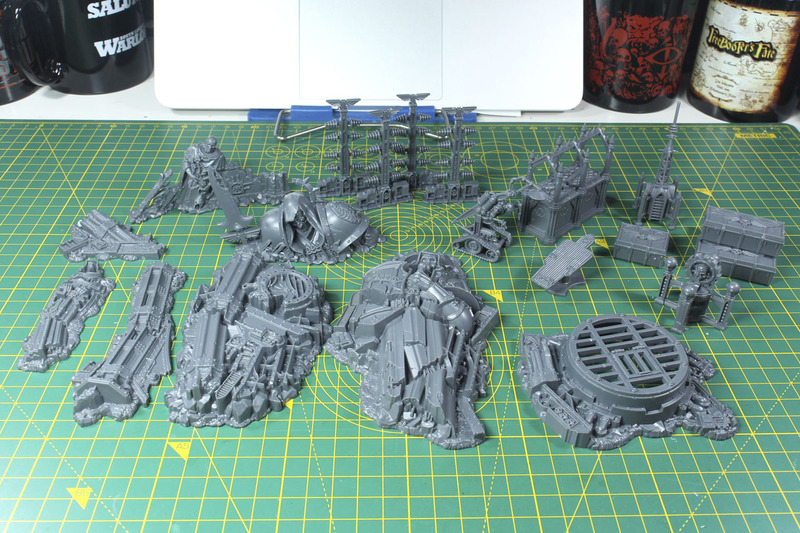 The whole set of terrain pieces in this kit. As for the rules in this kit; having some sort of guideline for campaign play is always a good thing. If you only play the regular battles, you have less motivation to play special scenarios, with for example assymetrical initial situations. Having connected or narrative games is something, at least for me, that adds to the gaming experience. The books starts with the coverage of the Sector Mechanicus and Imperialis. With the ongoing Vigilus campaign, the upcoming release of the Genestealer Cult (a war from within) and the continuation of the Necromunda system, all topics that can be used within the frame of urban warfare. The book itself introduces three different kinds of campaign structures, tree, matrix and team campaigns, to align / connect the matches with eachother. It covers its own set of rules with Streets of Death, for a modular, card based map, that up to four players can participate in. You conquer parts of the city, claim it for your force, upgrade it with fortifications and collect points along the game. Among the city parts are 6 special locations, that have their own specific missions, with additional rules and they rely on a lot of terrain (seriously, a lot). Streets of Death covers around one third of the book. The last chapter, roughly another third of the content, is about the Cities in Flames rules, another set of rules, focusing more on the claustrophobic, urban warfare. In there you'll find another set of rules, among others, for specific pieces of terrain (giving you boni while holding them or making it more difficult to fight within them, for example). And strategic objectives, to move the games from just pure annihilation to different kind of goals. Cities in Flames covers 6 narrative and 6 balanced missions, along with open missions. As the main goal of an campaign is to motivate a group of players over a certain period of time. While rewarding victorious players or the achievement of certain missions, they are more about entertainment. I will not go into the meta-level of this set, weither it is balanced or not. Urban Conquest covers quite a lot of ideas and impulses, that can be used to add a new energy to your gaming group, and it is not house rules or some fan made supplement, but an official release, so rather easy to agree upon. I really like the idea of the tactical mission objectives. 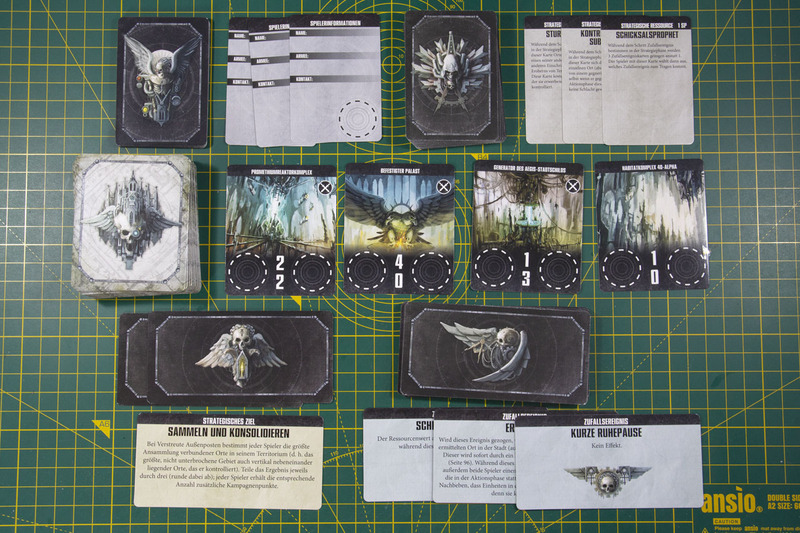 This is something that appealed to me in the second edition, that you drew mission objectives from a deck and those modified the scenario further. Of course, if you dominate your opponent, they will make little difference, but with close games, these small bonus points can help to turn the tables to your favour. As a box itself, 80 EUR isn't cheap, I would have preferred a price tag around 60 EUR - but as this is a campaign supplement, you wouldn't buy this kit by yourself, but as a club or gaming group and with the focus on a group of 4 players, everybody pitching in 20 EUR, it is rather reasonable and it covers a lot of re-playability, as the mixture of the location and different objectives / boni, create a lot of variation. On top of that, the terrain set itself, would probably be priced as two kits for around 20-25 EUR each, adding to 40-50 EUR. The card decks are usually around 10 EUR, and a book supplement around the 30 EUR range, so this adds up to a bit more than the 80 EUR of the box. 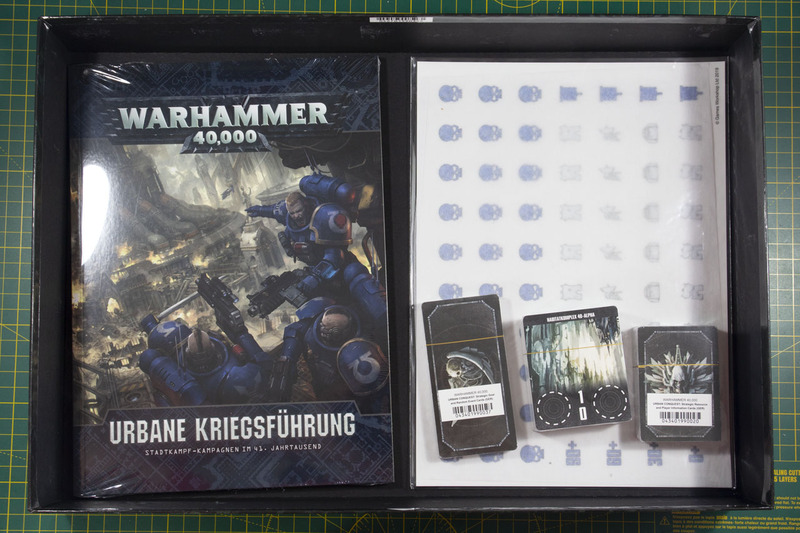 Not counting in the map, which is special made for this kit and an interesting, durable and easy to store solution to keep track of the campaign. Yes, the Planetary Empires, with its hexfield, might be more appealing, but it was rather difficult to store and you had to get creative to pin it to the wall. I like the concept of the plastic map, as you could use white board markers to take notes and clean it of later. 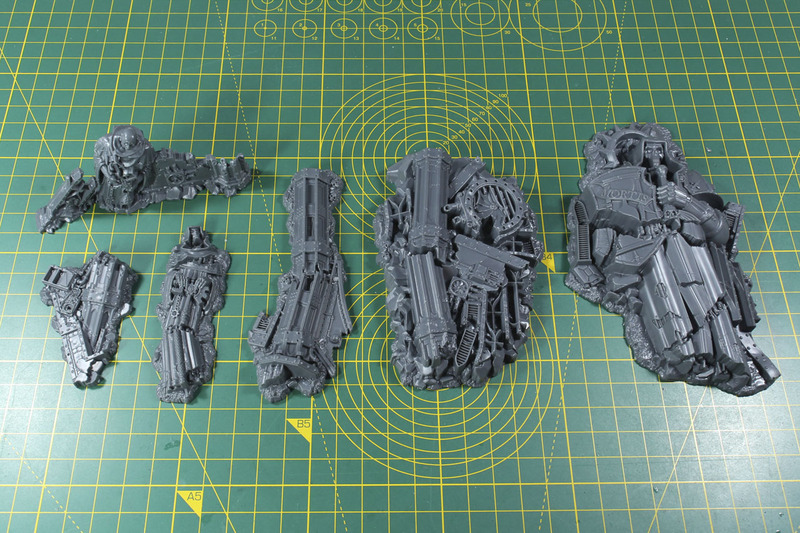 As for the pieces, I like the ruins from the Sector Imperialis. Nice addition to the existing range and along with some of the smaller parts, make a great selection of objective markers. Just as they are intended. I can see map and cards being used for other games as well, like Necromunda. As this supplement is about urban warfare and city fights, it requires / promotes a certain density of the terrain. Some of the setups of the special locations require certain terrain kits as well. So expect to either already have an elaborate terrain collection or extend yours accordingly, if you want to play these true to the book. 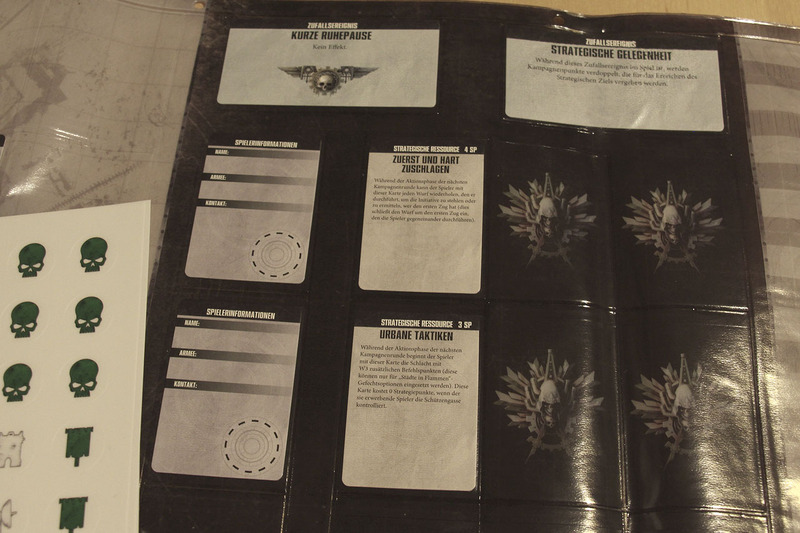 Urban Conquest is an expansion to the core rules of Warhammer 40,000. You will need the main rule book and the rules for the armies you play to use this supplement. Warhammer 40.000 is a brand by Games Workshop.